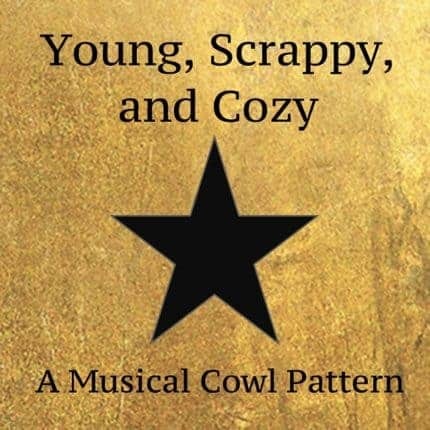 A Hamilton-themed Mystery Knit-A-Long! The project will result in generous cowl that wears a bit like a shawl (but is easier to drape around your neck). Each clue of the pattern has references to the show, and the cowl itself will have elements that are reminiscent of it as well. Don’t worry if you’re (gasp) not a Hamilton fan — those elements can be skipped very easily, and you’ll still have an awesome cowl in the end. The project requires less than a typical skein of DK weight yarn in each of three colors, so it’s terrific for stash busting as well. 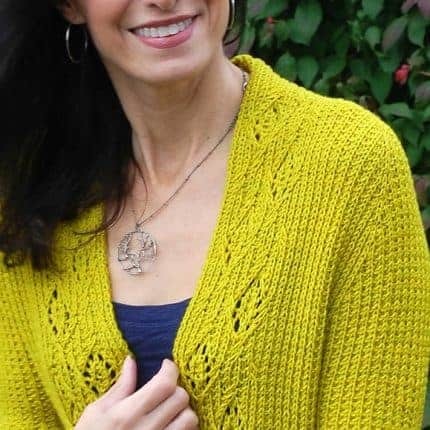 The second installment in the Cardigans of the Galaxy series, this comfortable, open front cardi is inspired by the character of Rocket in the Guardians of the Galaxy movie series. A genetically modified raccoon, Rocket makes an unlikely superhero. He’s irritated that he doesn’t fit in anywhere, but there’s no confusion over his feelings for money (spoiler: he loves it). 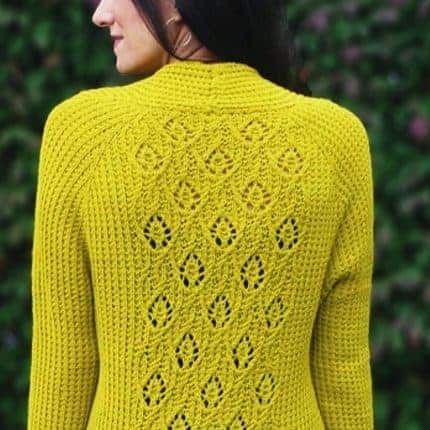 Rocket’s cardigan is a nod to both: He gets a top-down, cardi that’s the color of money (gold and green) with a diamond lace-and-cable motif that weaves in and out of a broken rib pattern. And hey, who isn’t a little broken? 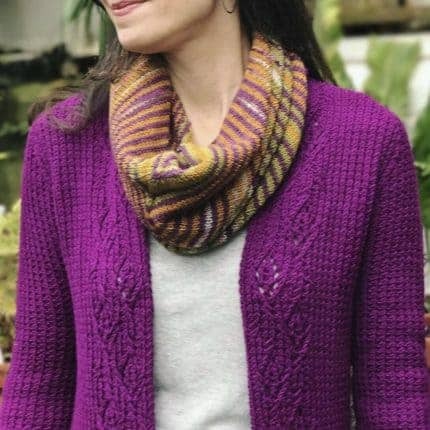 Enjoy 30% off Rocket’s Cardigan of the Galaxy pattern now through April 15th with the code Oogachaka. 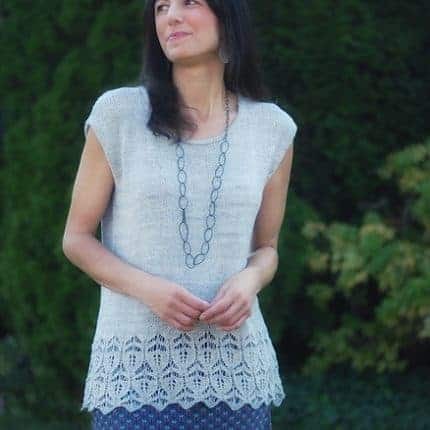 Worked seamlessly from the top down with one of the prettiest lace patterns ever (both charted and written out), this versatile, drop-shouldered pullover can be worked either as a sleeveless top in a lightweight fiber for warm climes, or with sleeves to keep you cozy in chilly weather. Short rows shape the shoulders so that they angle downward (no dreaded “wings” at the shoulders!) and reduce bulk at the underarms. Slim sleeves keep the look modern and sleek. 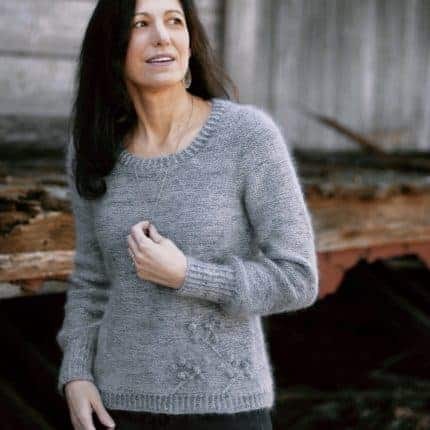 A photo tutorial lets you check your work, and Lyrical Knits’ popular Some Thoughts About Fit section is included to help you modify to your tastes.